Attending law school is an investment in your future, but it costs money. To help pay for it, you may wish to apply for financial aid. The first thing you must do is complete the Free Application for Federal Student Aid (FAFSA). By completing the FAFSA, you are applying for gift aid (scholarships and grants) and self-help programs (Federal Work-Study and loans). Filing a FAFSA is something that you must do every year in order to receive your financial aid. If you need a paper FAFSA mailed to you, you may request one by calling 800.433.3243. Students must complete the Free Application for Federal Student Aid (FAFSA) each academic year in order to be considered for grants, loans, and work-study funds. If you or at least one parent do not already have an FSA ID, request one immediately online at https://fsaid.ed.gov/npas/index.htm. The FSA ID will allow you to sign your FAFSA electronically. Click on the following link to view the documentation on creating your new FSA ID. Families need to include taxable and non-taxable income on the FAFSA. 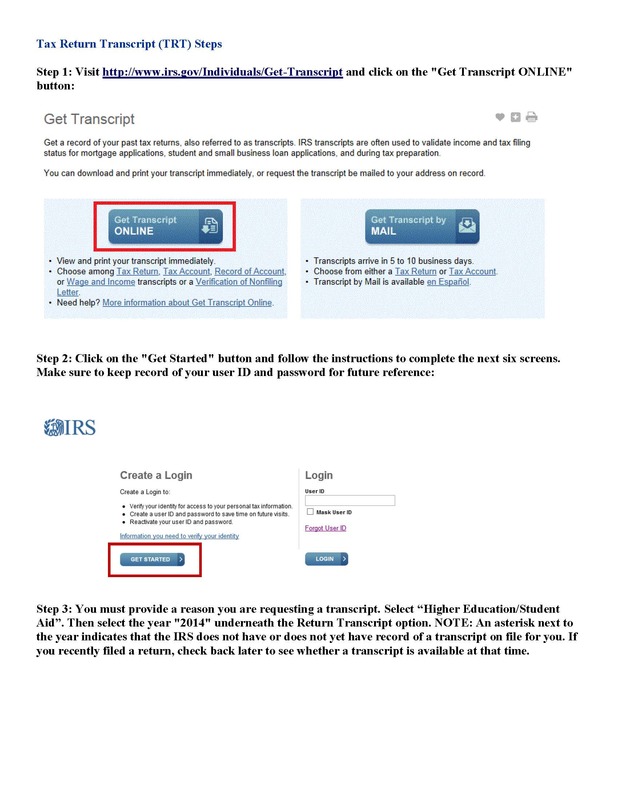 The IRS Data Retrieval Tool is available to help applicants complete their FAFSA accurately. It may take several weeks for the IRS Retrieval process to be available to families once their federal tax returns are filed. Allow at least three weeks for the IRS Data Retrieval tool to become available once you file your tax return electronically. Allow eight weeks if you file paper tax returns for the IRS Data retrieval tool to be available. Complete the FAFSA each year as soon after January 1st as possible. Cleveland-Marshall does not have a priority date, but it is recommended to file your FAFSA early using the IRS Data Retrieval process to provide accurate tax information and avoid processing delays. It is recommended that Federal tax return(s) be filed before you complete your FAFSA. If your financial aid file is selected for verification, you must submit tax and income information using one of the following two methods unless you/your parents file or are required to file a foreign or Puerto Rican tax return. Approximately three weeks after you/your parents file your/their federal tax return(s) electronically and six to eight weeks after mailing a paper tax return to the IRS, you/they may be able to update your FAFSA and copy the tax and income information from the IRS to the FAFSA using the IRS Data Retrieval Tool (DRT). This is the preferred method for you to supply tax and income information to our office and will speed the processing of your financial aid. Do not delay. You must be admitted to Cleveland-Marshall before you can be considered for financial aid. To complete your admission, click on the link to the admission process for Cleveland-Marshall. You will also need to make sure that all necessary financial aid documentation has been received. You can look in CampusNet in the FA Office tab under documents to check the status. You also should learn more about the types of financial aid. 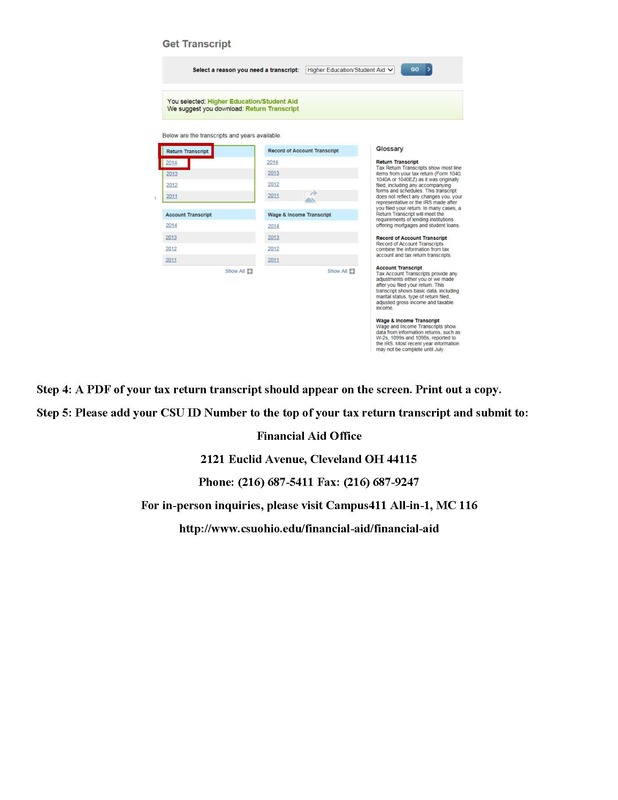 All students must have an official final high school transcript on file at Cleveland State University before they can receive financial aid to pay their CSU bill. Students who do not have a high school diploma must submit an official copy of their GED certificate. If you are currently attending CSU and receiving financial aid, you must file a Renewal FAFSA to be considered for financial aid for the next academic year. You can file your Renewal FAFSA online at www.fafsa.gov after January 1. Your FAFSA for the current academic year must be on file at CSU, regardless of which semester you transfer to CSU. The current academic year at CSU would consist of fall, spring and summer, in that order. If you filed the FAFSA but did not add CSU as a receiving school, you need to access your FAFSA online and add CSU as a receiving school. Once your request has been processed and your admission is complete, we will be allowed to view your FAFSA and process your financial aid. All transfer and readmitted students must submit an official final high school transcript, an official copy of the GED certificate or a final transcript showing that they earned an Associate Degree. If you received financial aid at a different institution for part of the current academic year, aid offered for the remainder of the year at that school is not transferable. In addition, if you have loans at that institution, you will need to have them cancelled before you can receive loans at CSU. This may take several weeks. Once that is completed, we will determine what aid you have remaining and email you. Once your transfer credit evaluation has been completed, you may check with Campus411 All-in-1 to see if you are eligible for any additional student loan funds. Loan amounts are based on your academic grade level (freshman, sophomore, junior, senior). Transfer students can also review frequently asked questions. New transfer and returning students to CSU are encouraged to read carefully the Financial Aid Office Standards of Satisfactory Process Policy. Federal regulations require that you complete your academic program within 150% of the standard timeframe for your program. At CSU, 128 credits are used as the standard, with 192 attempted credits as the maximum credits for a Bachelor’s degree. All credits are counted, even if you did not receive financial aid and even if the credits do not count towards graduation for your present academic program. Once you reach the maximum number of attempted credits for your academic program, you are ineligible to receive financial aid. Post-Bach program admits: All credits that you earned while at another school(s) and that are accepted, as transfer credits at CSU along with all attempted/earned credits at CSU are part of the number of credits needed for your second degree program. If you transfer in more than 191 credits, federal regulations will not allow CSU to offer you federal aid unless you are admitted into an approved program. An example of an approved program is the accelerated nursing program. Degree-seeking graduate students are eligible for student loans. The same FAFSA rules and regulations apply to graduate students and undergraduate students. In addition to student loans, you are eligible for a variety of assistantships to help you cover the cost of tuition. For financial aid purposes, half time enrollment is six (6) credit hours. Non-degree graduate students may also be eligible for loans but this is based on the amount of money they are permitted to borrow as an undergraduate student. Non-degree graduate students are eligible for a one-time award consisting of three consecutive semesters of loan eligibility. Students must be enrolled for six credits per semester. Law students who are in need of financial aid must complete the FAFSA. For financial aid purposes, half time enrollment is six (6) credit hours. You may still be eligible to receive Pell Grant funding for the summer but only if you have not used 100% of your Federal Pell Grant Award for 2015-2016. If you have not used 100% of your Pell Grant for 15-16, you may have remaining Pell eligibility left to be used during the summer at CSU. To figure out what semesters you should look at for remaining eligibility, you would look at Summer 2015 but only if you attended and received Pell at another school, otherwise you would just look at Fall 2015 and Spring 2016 semesters. Generally, this availability is for students who attended CSU part-time Fall and/or Spring therefore having a percentage of eligibility remaining. If you attended fall semester 2015 and spring semester 2016 full-time, you will not have any Pell Grant eligibility for Summer semester, 2016. If you enroll full-time fall 2015 and only half-time for spring 2016, you will have 25% of your Pell award that can be used towards summer 2016. These examples are based on students meeting all financial aid eligibility requirements. If you are attending at least six credits this summer at CSU and have Direct Stafford Loan eligibility remaining from the 2015-2016 academic year, you should complete the Summer Aid Application. The Financial Aid Office will determine your eligibility. To borrow loans, you must enroll for a minimum of six credit hours at CSU. Student/Parent must complete a PLUS request form and submit the form for credit evaluation. There are no scholarships offered in the summer unless your academic program or college offers the awards. Honors Program and Athletic Department awards are determined by those departments. If you wish to enroll in an approved study abroad program, you must have the Study Abroad Consortium agreement completed and all appropriate approvals submitted in order to have your aid disbursed. Aid eligibility is determined based on same awarding standards as regular CSU enrolled students. If you are a law student and wish to be awarded summer aid, you must enroll in a minimum 6 credits at CSU this summer. You will be awarded any remaining Direct Stafford loan eligibility remaining from the 2015-2016 academic year. Additionally, you will be offered a Graduate PLUS loan. If you wish to be considered for this credit-worthy loan, you will need to complete and submit the Graduate PLUS form. CSU does not provide financial aid to you if you are enrolled as a “visiting student” at another institution. Please check with your Advisor and the University Registrar rules regarding transient permission to take classes outside of CSU. There are a few specialized programs that are exempt but if you are in one of those programs, you will be notified about the exemption. Non-CSU students need to contact their home school. Please note: You must make payment arrangements with CSU regardless of any aid that may be processed by your home institution. If you are not enrolled at CSU as degree-seeking student, you must obtain any financial aid assistance from the school that is granting your degree (home school). You should check with your financial aid office to see what aid might be available while studying at CSU. Generally, you will need to complete a consortium agreement, which can be obtained from your home school. These agreements require a signature from CSU's Financial Aid Office. All schools disburse financial aid on different dates and will make aid checks available directly to the school or to the student. Therefore, if funding will arrive after the tuition due date, you may wish to use one of the available payment options.